We woke to a light dusting of snow this morning. It was so pretty, as the sliver of sunrise glowed magenta at the horizon and just above that, the puffy snow clouds swirled about. I love that magical moment, at the edge of a storm, when the light reflects and it seems like the whole world is glowing the most perfect shades of blue, gray, green and gold. I am holding onto every last moment of fall, but mother nature has her subtle ways of letting me know that it won't be long now. Knitting: New hats for me and my guys, because I'm a firm believer that you can never have too many knit hats. By some coincidence, I found a skein in my stash that was exactly the shade of the sky this morning. (Quince and Co bare Osprey that I dyed a while back) I'm adding swirling cables to mimic the clouds, moss stitch for the golden fields, and long lines for the standing pines. I'll be sure to post a picture when it's finished. Reading: Poetry by Edgar Allean Poe. I found this little book of poetry at the thrift shop a few years ago and I love to bring it out every once in a while. It's about the size of a post card and has tiny little roses on the front cover. The first few pages are missing, so I did a little research and it looks like the book was printed around 1899 by Henry Altemus Co. My favorite part is the handwritten notes from the previous owner. She's filled all the blank spaces with some of her favorite poetry. 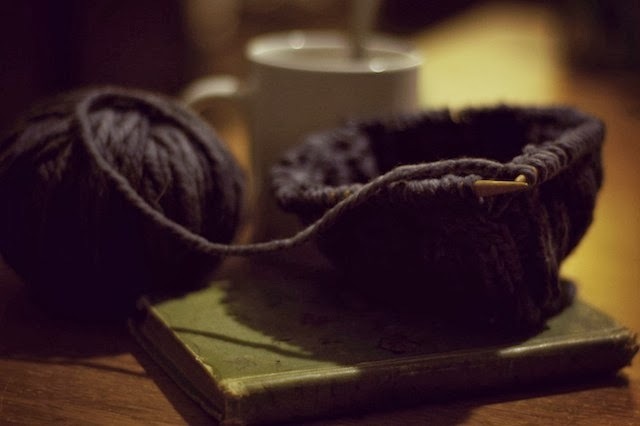 What are knitting and reading lately?